Discover the Carmelite tradition of prayer with this practical and empowering Lent devotion that helps you explore prayer in a new way. Want to deepen your faith over Lent? Faith is, and always has been, a journey towards something greater than surface existence. Something deeper. Something more spiritual. This commitment to leading a life of depth - through prayer, presence, and a loving friendship with God - is what is part of what paves the Carmelite way. Lent, after all, is a manner of journey. Over 40 days of refocusing, repentance and fasting you can find transformation of thought and spirit, With a sight towards God, these reflections give you the space to find strength in God, as well as a series of questions to get you thinking about the truths of Lent. A call to take up your cross, The Way of the Carmelites is an antidote to the convoluted modern world. A road to deep prayer and closeness with God. The Way of the Carmelites by James McCaffrey was published by SPCK Publishing in November 2017 and is our 20208th best seller. The ISBN for The Way of the Carmelites is 9780281075294. Be the first to review The Way of the Carmelites! Got a question? No problem! Just click here to ask us about The Way of the Carmelites. Carmelite spirituality is based on a deep relationship with God in prayer, focusing on the presence of God within us, and leading to a life permeated by closeness with God and concern for our neighbour. 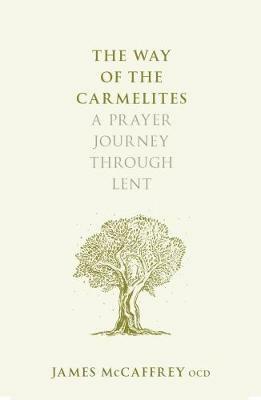 This beautifully written book, rich in reflection on the Bible, is a spiritual companion and guide for Lent, and indeed the rest of the year, that will introduce readers to the riches of Carmel. Prayer, in the Carmelite tradition, is friendship with God. It is being alone with God in a silent communion of love open to the Spirit. With our eyes fixed on the vulnerability of Jesus and on his unrequited love for us, we are transformed, and strengthened to give ourselves as he did. Our contemplation is the source of our practical action. The discussion questions at the end of each chapter facilitate this practical approach. 'To take up the treasures of Carmelite spirituality, and embark with Jesus on the Lenten experience of forty days in the desert, is a journey that can be enormously enriching and even life-changing.' From the Prologue.